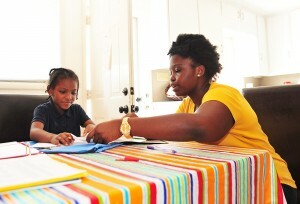 The Community Writing Center is an after school literacy program. It is a partnership between the High Point University Service Learning Program, Mount Zion Baptist Church, Penn-Griffin Middle School, and Kirkman Park Elementary School. Through the Center’s after school programs, Kirkman Park Elementary students in grades 4-5 and Penn-Griffin 6-8 graders receive tutoring and support from High Point University students. The Center’s curriculum focuses on improving students’ fundamental reading and writing skills through creative writing instruction, interactive and one-on-one reading exercises, and homework assistance. The program also fosters student relationships with University tutors and a greater awareness of the value of a college education. 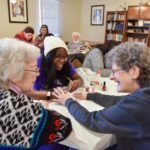 Volunteer staffing for the Community Writing Center is provided through High Point University’s Service Learning Program and Bonner Leader Program, in conjunction with the AmeriCorps VISTA Program at HPU. 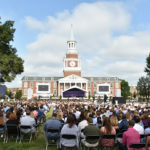 The Center and its curriculum are overseen by Faculty Directors Dr. Cara Kozma and Dr. Charmaine Cadeau, both of whom are members of High Point’s English Department and teach in the Service Learning Program. Initial funding for the Center was provided through a 2013 High Point University Think BIG Grant. High Point University students enrolled in English 1103 SL: College Writing and Public Life, English 2230 SL: Literature and Community, and English 4140 SL: Community Writing have the opportunity to work as volunteer tutors and coordinators for the Community Writing Center. See Service Learning Courses for current course offerings or contact one of the Faculty Directors for more information. The Community Writing Center is currently open after school for two hours three days a week. Student enrollment is limited due to space considerations and is restricted to students from KPES who have demonstrated academic need and are able to attend at least two days a week. Although the Center works with Guilford County Schools Transportation and Mount Zion Baptist Church to meet the transportation needs of as many students as possible, transportation is not guaranteed. Parents interested in learning more about the application process should contact Dr. Cara Kozma at ckozma @ highpoint . edu. All inquires about the Program Director position should be made to Dr. Cara Kozma at ckozma @ highpoint . edu.